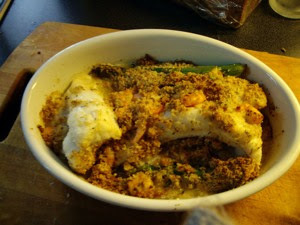 This is a recipe inspired by Pete McDonnells fish pie, that I enjoyed in Salisbury MA, a few months ago. 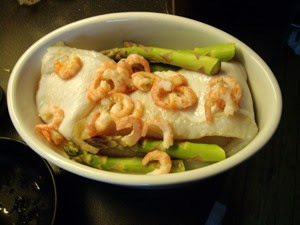 It is basically the same recipe, but using 1 lb of lobstermeat was out of the question, so I used precooked shrimps and asparagus instead. The modified fish pie recipe was a success, so that is definitely something to serve again. 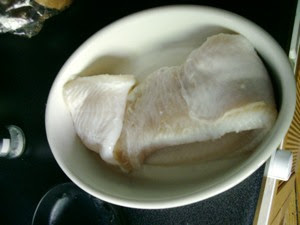 I used a 600 gr / 1,4 lb wolf-fish fillet and I placed in a ovenproof dish. I used 5 large asparagus, but use as many as you want. Bend them until they break, and you will not have to eat the woody part of the stalk. Alternatively, you can peel the asparagus. Place them along the fish fillet. Then place 20-30 shelled shrimps on top of the fillet. You can use the leftover woody stalks to to make a delicious soup. See how you prepare them, and get a good soup recipe here. Put 100 grams Ritz crackers, 50 grams cheddar cheese, as much garlic as you want, and dried herbs (thyme, rosemary, oregano) in a food processor and run until the the crumb mixture has been thoroughly blended. 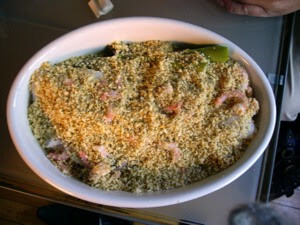 Place crumb mixture evenly on top of the fish. Then melt 75 grams of butter and pour over the mixture. Do not add salt, as both the crumb mixture and butter contains enough salt to flavour the dish. 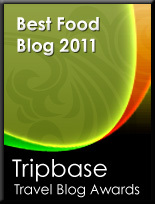 Place in a medium hot oven 180-200C / 365-400F for 35-40 minutes. And here is the end result. I could have used some more crackers to cover the the fillets properly. They were so fresh that the curled up in the oven. Making a New England fish pie is a delicious way to prepare white fish. 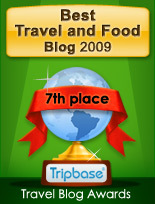 I served the fish pie with rice and a bottle of Soave Classico that worked very well with the fish.